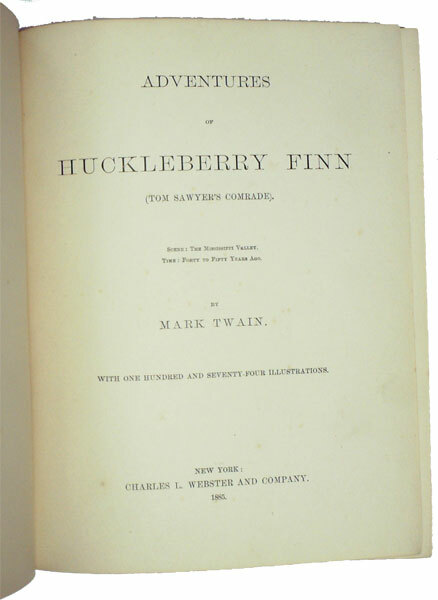 Barter Books : Twain, Mark; [Clemens, Samuel Langhorne] : The Adventures of Huckleberry Finn (Tom Sawyer's Comrade). Webster edition. Frontispiece and 173 text illustrations by E. W. Kemble. 220 x 180 mm (9 x 7 inches) - 366pp. 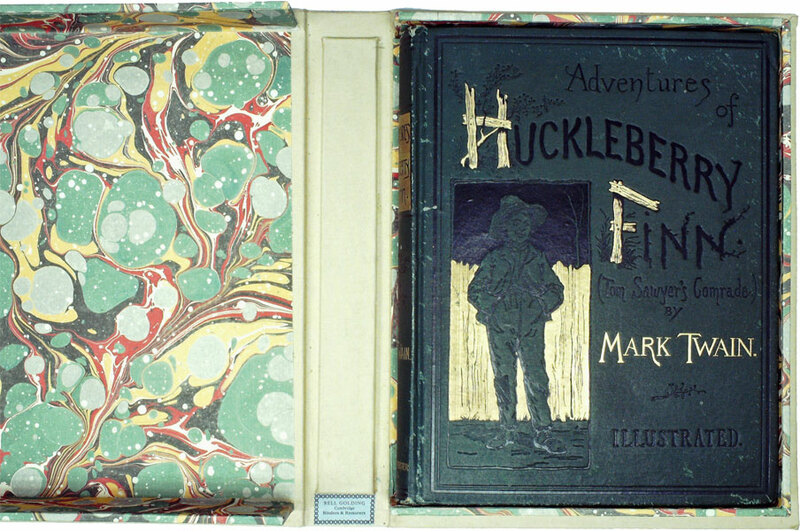 Original green pictorial cloth, blocked and lettered in gilt and black in folding cloth and marbled paper covered collector's box. 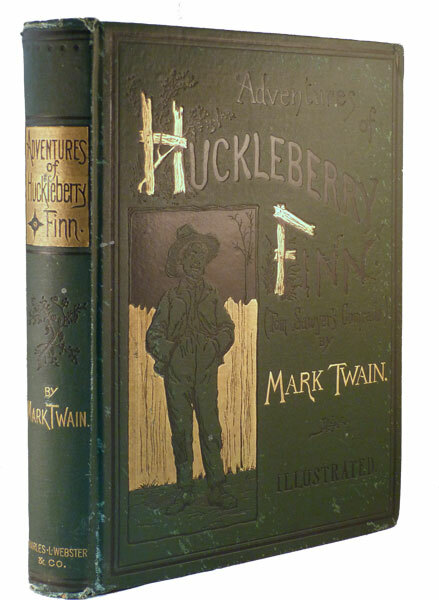 VG : in very good condition without dust jacket as issued. Some minor wear to head and tail of spine, and scattered damp-flecks to boards. Front hinge cracked at frontispiece. Insect damage to interior of front and rear boards and tiny hole in ffep, plus some small areas of loss to rear endpapers and pin sized hole to p.366. 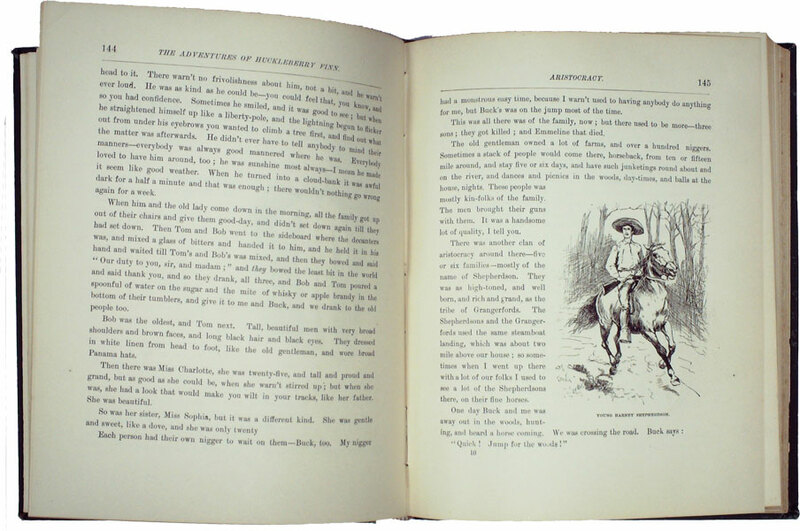 First American edition, early issue with BAL points: copyright notice dated 1884, "was" for saw on p. 57, the "Him and Another Man" plate listed incorrectly as being at p.88, pagination on page 155 with final "5" missing. Photogravure plate by Heliotype Printing Co. of a portrait of bust by Karl Gerhardt with a tablecloth visible (BAL state 1), with the final blank leaf, also with the misprint "decided" on p. 9. Missing "L" from illustration on p.143, later corrected to "Col", as well as broken "b" in "body" on line seven. 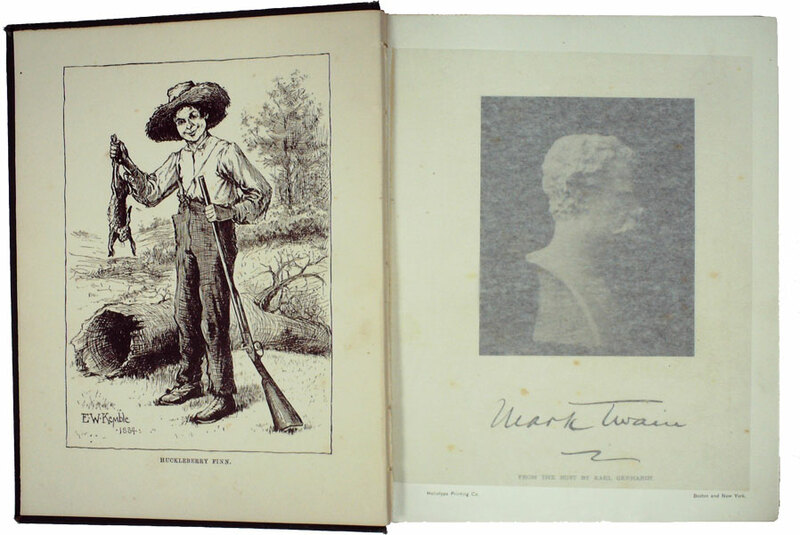 This copy is inscribed and dated by its first owner "6th April 1885".